Student Spotlight: Davon Jones | The Pinnacle P.O.V. 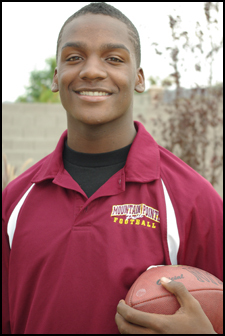 As a star running back for Mountain Pointe High School, Davon Jones is quite familiar with making the right choice. From quickly hitting the hole, to being patient and following his blocks, Jones has many decisions to make underneath the Friday night lights. But one of his biggest decisions wasn’t made on the field, and it had nothing to do with victory or defeat. Since Jones was a member of his high school football team, much of his time was devoted to football. From practices to watching game film, weight training to game days, finding the time to focus on his school work was difficult. Enter Pinnacle Online High School. In order for him to continue to excel both on and off the field, he decided to go with Pinnacle’s program. Jones was able to take some of his high school courses online while still attending his original high school. The flexibility of Pinnacle’s course schedule allowed him to work on his classes at time that best fit his busy lifestyle and pace. Pinnacle’s online classes also made it possible for him to continue his extracurricular and athletic pursuits during the summer while he participated in football camps around the country. Another benefit of Pinnacle’s online high school program is the ability to recover credits of missing or failed classes. High school athletes can even enroll in Pinnacle’s classes to make sure that they are academically eligible to attend a college or university. And Jones’ mother, Roinesha Johnson-Jones, is glad they utilized Pinnacle’s program. With the help of Pinnacle Online High School, Jones has successfully balanced school and football and is on pace to graduate high school in 2010. He also plans to attend college on a football scholarship and continues to focus on his aspiration of playing in the NFL. ~ by pinnaclepov2224 on December 11, 2009. Great interview on an awesome athlete. Congrats Dada on your award-winning season!!! Can’t wait to see where you are headed after graduation.